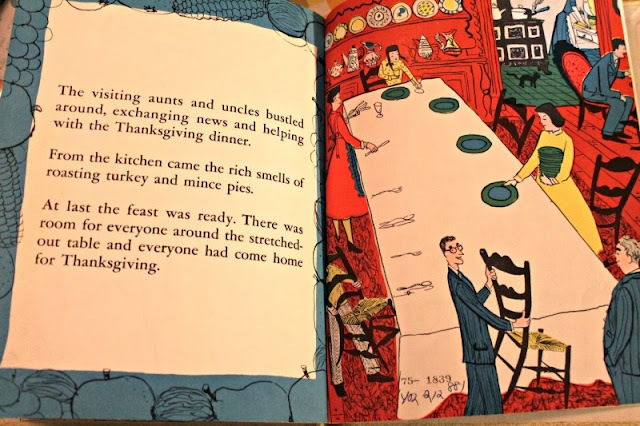 Thursday is Thanksgiving Day here in the States, a holiday I'm determined not to forget about, even though the Christmas season is already rushing in. I'm not even sure if we will have much of a Thanksgiving. 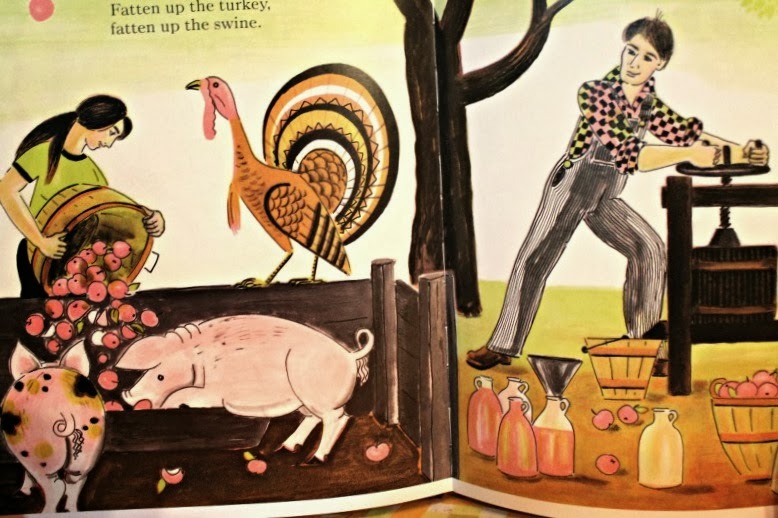 Mr. B is the usual turkey-cooker, but he will probably be working Thursday. There is a chance he may be off Wednesday, which is the first day of Thanksgiving break for everyone else, so we may have an early dinner. But today, I offer you a visual feast in the form of two books, both having to do with fall harvest time, and both culminating in Thanksgiving feasts. Oh, and I should mention that both books feature illustrations by two of the greatest. 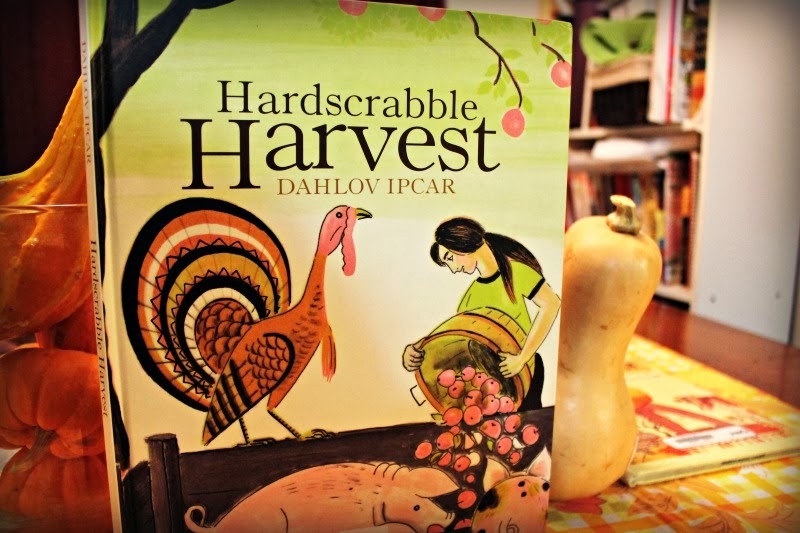 Hardscrabble Harvest by Dahlov Ipcar. Originally published by Doubleday & Co., 1976. Reprint edition by Islandport Press, 2009. I love Dahlov Ipcar's illustrations. The story is simple. 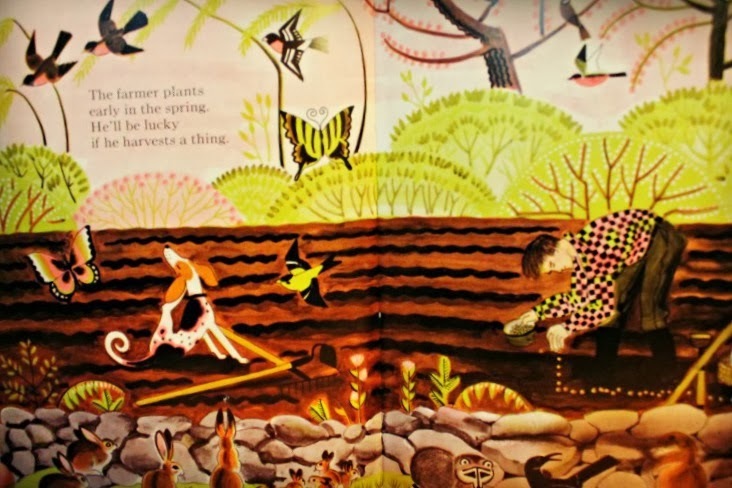 The book demonstrates threats faced by the crops planted at the beginning of the book. There are crows, chickens, ducks, sheep, rabbits, horses, raccoons, and deer, wreaking havoc in the fields. 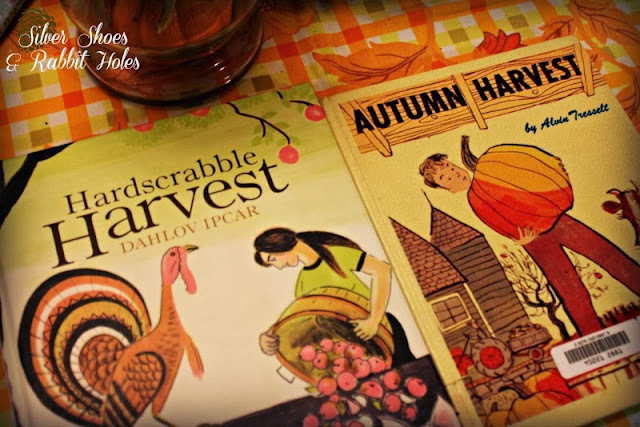 Finally, the farm couple rushes to harvest everything they can before the freeze, and a Thanksgiving feast is shared at the table. 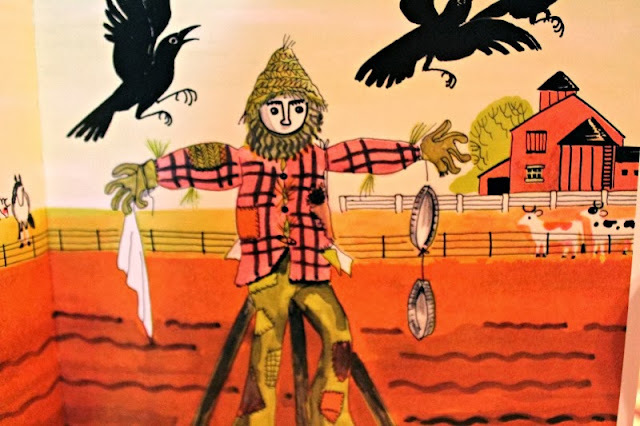 The other book I have to share with you was written by Alvin Tresselt, best-known for his 1964 re-telling of The Mitten, and the Caldecott Award-winning White Snow, Bright Snow. 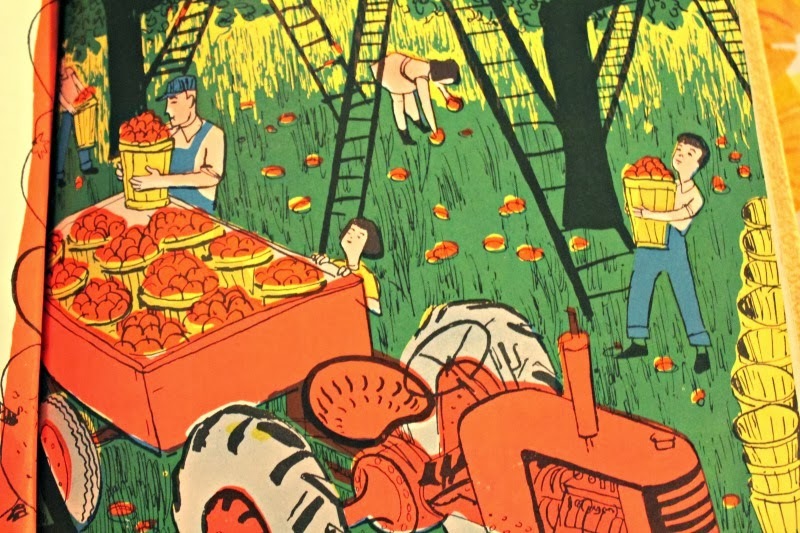 Autumn Harvest is illustrated by his collaborator on the latter, Roger Duvoisin. Autumn Harvest by Alvin Tresselt, illustrated by Roger Duvoisin. Lothrop, Lee & Shepard Co., 1951. 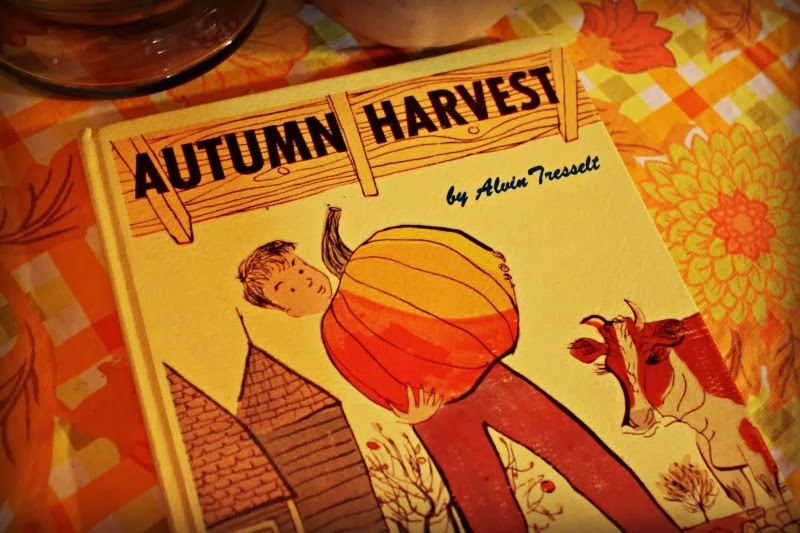 Tresselt begins the book with summer's end, then weaves the simple story of one autumn: the ripening wheat, the threshing machines, birds and mice gathering stores for the winter, the changing of the leaves, the katydids singing their song, "Katydid...katydidn't..." Children go to school, apples are picked and gathered, corn is shucked. 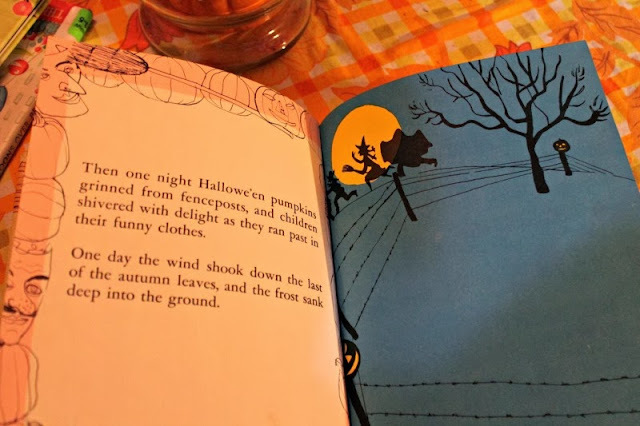 Hallowe'en is celebrated. Finally, the harvest is gathered, relatives arrive, and a Thanksgiving feast is celebrated in the farmer's home. So sweet. I love the vintage style art I grew up with. 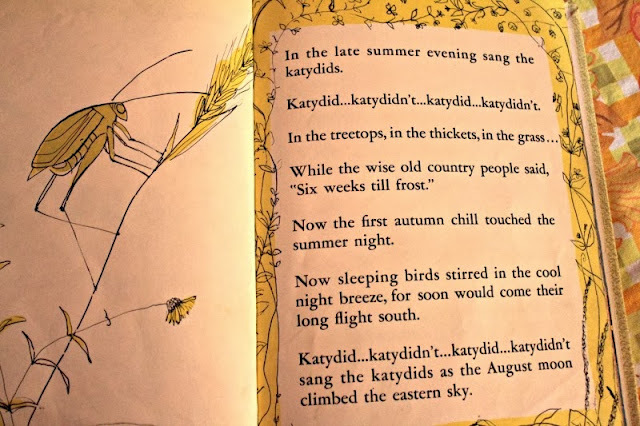 What year was this published? 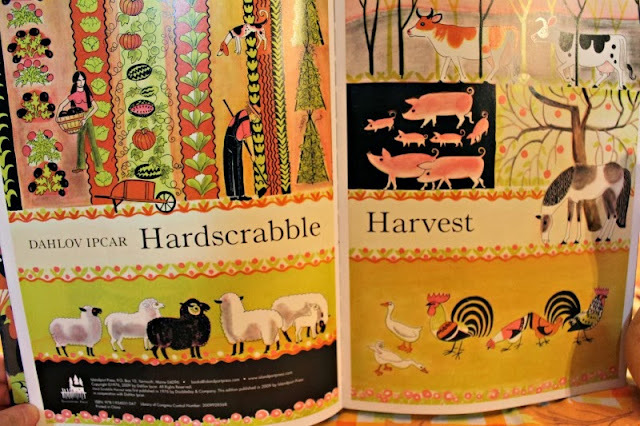 Hardscrabble Harvest was originally published in 1976. Islandport Press has reissued quite a few books by Dahlov Ipcar. It's lovely to see new copies. 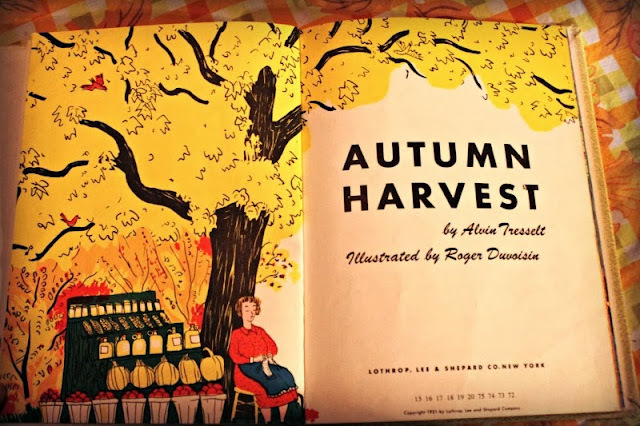 Autumn Harvest is from 1951. It appears the last reprint was sometime in the early '90s. Thank goodness for the library! Very pretty illustrations! Very orangy too :) What will you cook for Thanksgiving apart from the turkey? 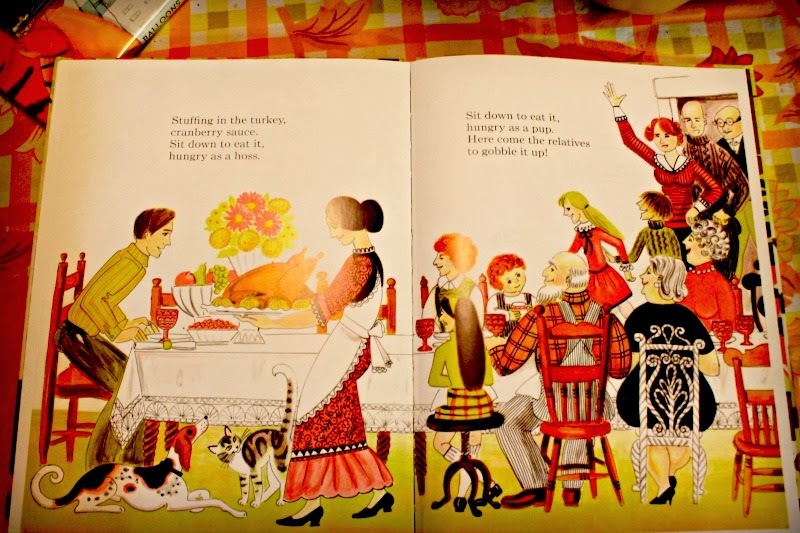 Especially orangey with my great-grandma's tablecloth! I don't make turkey myself - I leave the poultry to the meat-eaters. ;) We have decided that we will have a tiny dinner of our own on Wednesday. Mr. B will forego is beloved dark meat, and will just roast a turkey breast. 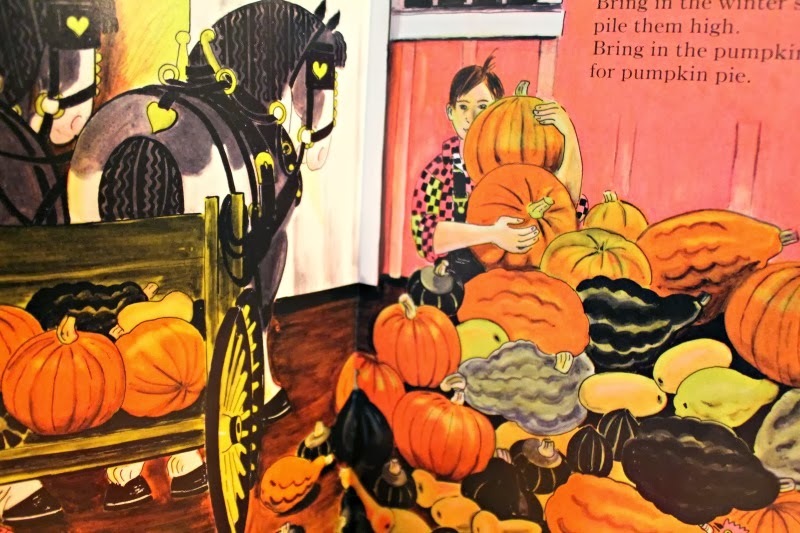 I'm making pumpkin pies, potatoes, roasted root vegetables, and some kind of kale dish. I also want to try my hand at a homemade-from-scratch green bean casserole. Mr. B will be working on Thursday, but my dad, grandma, sister and her husband and their girls will come over Thursday night. I'll repeat a few things, and I'll add butternut mac and cheese, sweet potato rolls, sweet potato casserole, and this mashed carrot and mint recipe from Fine Cooking. Grandma's bringing a ham, since my sis and her family are having an earlier turkey dinner at her mother-in-law's. It sounds like a lot, but I like to cook, and some it can be made ahead of time. ooooh these are just lovely! Lovely! oh guess what. i hung a strand of Christmas lights. I CAN'T HELP IT!!! Most of my Christmas stuff is in heavy bins in the shed, so Mr. B will have to get them out for me. I still have my fall stuff up through Thursday. I don't really know how the whole decorating thing will go, since he's going to be working so much. He has 2 mandatory days off - tomorrow and Wednesday - which will be spent cleaning and having our own mini-Thanksgiving. I don't know if we'll even do a real tree this year. The upkeep might be too much for me to handle on my own (I'm a notoriously bad waterer), so we may do artificial. We have one in storage somewhere, or we might grab a white one. I like the look of white ones. Beautiful books! 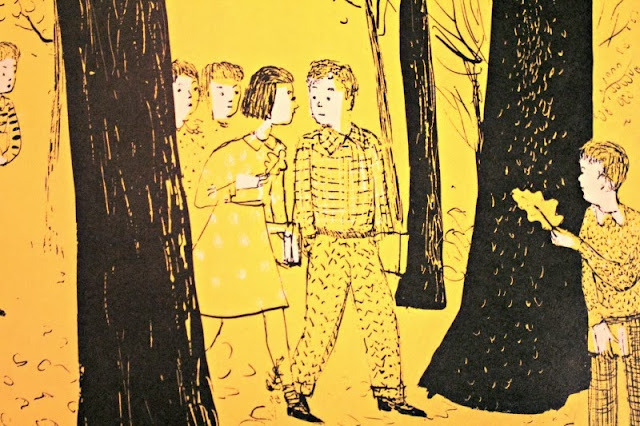 I love the illustrations in both. such lovely books!!! 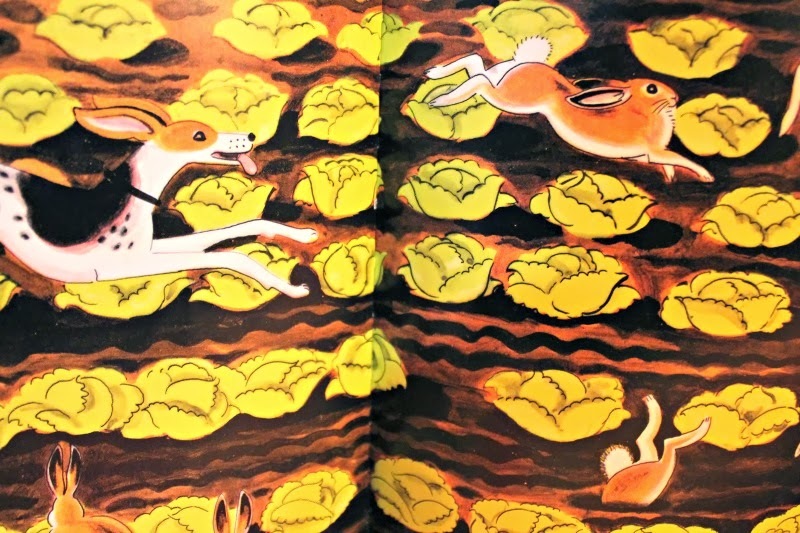 Oh, I just love the way the illustrations make you feel- just perfect!